New Delhi: Delhi's 2010 Commonwealth Games are all set to break all records for spending money. Billed as the costliest Commonwealth Games ever, it's reportedly already crossed Rs 30,000 crore budget. While this also includes an upgrade of the capital's infrastructure like roads and flyovers, not all of it will add to Delhi's quality of life. The government plans to spend Rs 150 crore on a gala opening and closing ceremony which includes Rs 5 crore being paid to Oscar winner A R Rahman for the theme music. But of this budget, a whopping Rs 40 crore will be spent to lease a helium blimp - a big balloon the gas for which apparently will also have to be imported. The blimp which will so far be used for the opening ceremony, will have lights and cameras mounted on it. Thought it will be removed after the opening ceremony, there will be more costs if it is to be used for the closing ceremony. "What is the need for a balloon which costs Rs 40 crore? Even the gas is coming from Russia I believe. This is nothing but an excuse to spend money," organising committee member VK Malhotra said. An Italian company K-Events has reportedly been given the contract for managing the blimp. The company's website claims it specialises in hosting global events including the opening ceremony for the Turin Olympics in 2006. "The way the preparations for the CWG are going, has put the country's reputation at stake, we will raise this in Parliament," BJP leader Shahnawaz Hussein said. 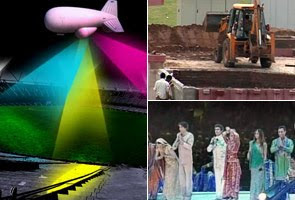 From dedicated elevated flyovers for players, to a spectacular opening and closing ceremony, while the organising committee has promised Games we will not forget, the fact is that the organising committee has not been able to raise the level of sponsorships it had hoped to. And the question for many then is that once the Games are over who will foot the bill?